It seems as if every road in Wisconsin has frost heaves every 5 feet. After 6 days of riding, my hands were sore. Even an easy spin after arriving on day 1 created a challenge to find a smooth section of road. The worst was the race in Racine. By the end of the race my triceps were fatigued from road shock. But I was told: there is no such thing as bad pavement, only too-skinny tires. One evening I went to see a movie at the mall megaplex not far from the hotel. Since I was early, I wandered through the mall for a bit. As one would expect, the mall stores gave no indication that I was in Wisconsin. I could have been anywhere. Except for the bacon kiosk. In the middle of the mall was a rather large kiosk selling bacon and other assorted fat-laden meats. I considered getting some to take into the movie, so that I might fit in as a local. But I was afraid of puking it up at the next day’s race. Criterium courses are closed to traffic, and race organizers do a pretty good job of keeping cars and pedestrians off the course. You might hear of an incident where a car gets on the course, but it’s pretty rare. But other bikes? In the Cedarburg race, I was in a breakaway with another rider. In the middle of the race, we made a right turn, taking the usual line of far left lane to far left lane. After the turn we looked up to see an old guy coming at us on his city bike waving and yelling at us to stay to the right. Luckily there were just the two of us, and not a field of 75 guys. I still can’t figure out whether the guys was mad there was a race going on, or whether he was a little “off”, or both. It’s no secret that Wisconsinites are known as cheeseheads. But did you know there is a “cheese castle”? On the way to the race in Kenosha you pass by the Mars’ Cheese Castle. It’s not a castle made out of cheese, but a store where you can buy cheese, sausage, and other artery-clogging delicacies. I considered stopping and buy some, but it didn’t seem appealing as either pre- or post-race food. Every one of the Superweek races requires a set of volunteers — to marshal the courses in particular. They always seem friendly. I talked to a mom and her daughter marshaling the Cedarburg race. When they found out I came all the way from Ohio, they decided to root for me during the race. This turned out to be the race I won, so I’m thinking I need to recruit someone at every race from now on. In addition to the marshals some of the races have police at intersections. In Racine I was at one of the corners, watching the race prior to ours. The cop was trying to get someone to answer their walkie-talkie. He turned to me and said, “it’s a damn cluster-f—“. He wasn’t talking about the race, or the racers, but the incompetence of the other guys he was working with. I guess it doesn’t matter what you do. You’re always surrounded by incompetence. Does Anyone Stay in Illinois for the Weekend? In 2001 I stayed until the last race on Sunday in Whitefish Bay. As I drove south out of Wisconsin along with half of the population Illinois, I swore I would never do that again. As it turns out, leaving Friday afternoon is no better. It appears that no one in Illinois stays there for the weekend. Half of them must go to Wisconsin, and the other half must go to Michigan. The roads were a clogged mess until hitting Gary, Indiana, where they magically opened up again. The scary part is driving around Chicago. I’ve driven in Boston and New York City, navigated my car through Munich, Duesseldorf, and Stuttgart. But nothing compares to the drivers around Chicago. 70mph in a 45mph work zone is slow. It also appears to be customary to change lanes two lanes at a time, without signaling (passing on either the right or left). I remember telling this to a colleague from our Milwaukee office. Next year, I drive back either late at night or early morning. I first went to Superweek in 2000. “Oh, you mean Stupid-week”, someone said to me. I told some people at work I would be taking vacation. When told that I was going to be racing each day for a week, they looked at me as if to say, “that sounds really stupid”. OK, maybe that does begin to explain it. Take 100 guys, put them on a different criterium course each day, in the middle of summer, and dangle some money in front of them. It’s bound to result in insanely fast races, aggressive riding, crashes, tempers, and a dose of stupidity. In other words, it’s some damn fine bike racing. You’d think that after racing a few days in a row, your legs would be shot. But for reasons I’m not completely sure of, mine never are. After a few days, you seem to get used to that feeling. And it helps that all you do is race, rest, eat, sleep, maybe catch a movie, then do it all again the next day. The perfect vacation. I have loved every trip I’ve taken to Superweek. There is nowhere else in the U.S. where every category of racer can race for 2 weeks straight. For Masters, outside of Nationals this is some of the best competition you will find. Most of us are used to racing against the same faces week after week. It’s refreshing to race against not just different guys, but different really fast guys. Guys who have come from California, Florida, and Texas — and not just because Wisconsin has good bratwurst. What’s really cool about the Masters races is that after a while you get to know and recognize these guys who come from all over. I might see a guy at an out-of-state race, or at Nationals, or when I go back to Wisconsin again next year. There’s good, hard racing — maybe some tempers flare, and words get exchanged, but there’s also a general camaraderie amongst the racers. At the end, guys shake hands, say it was great racing with you, and we’ll see you again next year. Superweek is one of the rare occasions when I have a lot of time to do nothing. It’s mostly just racing and resting. I’ve got plenty of time to get where I need to go, and I’m not in any hurry to get there. Driving to the races, and I can feel the tension and hurriedness of the other drivers. I’m going the speed limit, exactly, and I’ve got moms in minivans tailgating me while talking on their cell phones, people passing on the right, passing in unsafe conditions. I see 18-wheelers going 10mph over the limit. Delivery vans and pickup trucks, blasting off from red lights and probably watching the gas needle fall in real-time. Back at home I don’t notice this so much, because I’m often caught up in the same routine. But change the routine and it becomes apparent. Everyone’s complaining about the current situation with oil. But we don’t seem to consider doing the simplest thing we can do: just slow down. In my VW Passat, my fuel economy is at a minimum 15% better if I drive more calmly. Probably even more if I compare it to the way most people seem to drive normally. Just imagine if we all made this one small change in behavior, how much of an impact it would have. Most people probably know this already. Why then are we unwilling to change? I suspect that we are caught up in this collective mindset of frantic rushing around. We never want to feel inconvenienced or delayed. It’s the same mindset that makes drivers unwilling to be slowed for a moment by a bicycle. I think we need to ask the question: to where and to what are we hurrying? I remember very clearly how this struck me one day. I was riding to work and feeling overwhelmed by the steady stream of cars impatiently trying to get around me on a local cut-through road. I recall thinking that in the larger perspective it makes absolutely no difference whether or not I rush to get to work (or wherever I’m going). That mindset is self-created. You can try this out for yourself. On your next trip to wherever you’re going, make a conscious decision to drive 5 mph slower than you normally would. When you finally arrive, ask yourself whether it made any difference that you arrived those few minutes later than you might have otherwise arrived (and often that frantic driving doesn’t even get you there faster). Certain guys have reputations for yelling at other guys during races. I don’t want want to be one of those guys. I was thinking about this during the first race here at Superweek. When I see someone else do it, it seems really stupid. Mostly I’m easy-going, but there have been times when the lactic acid has built up, and the blood sugar has gone down, that I’ve yelled at guys in races. Oh, like maybe last Tuesday. Yeah, sometimes guys ride like knuckleheads. Maybe they don’t know better. Maybe they are just tired. Maybe they are intentionally being jerks, but can you always tell? I know this: the guys who I respect most don’t ride around screaming at other guys. I was thinking about this because twice in today’s race (Holy Hill) I had guys yell at me. I’ve raced long enough now to know what I’m doing. I had bridged across to a solo breakaway, and the guy yelled at me when I rolled past him. I was letting him get on my wheel and get a break after being out in the wind. Great, I really wanted to ride in a breakaway with him at that point. Later a certain well-known rider yelled at me, eyes flashing and spit flying from his mouth, to pull through to help him drag the field up to a 2 man breakaway that wasn’t going to succeed anyway. The thing is, I *had* just pulled off the front. In both cases I resisted the temptation to respond in kind, trying to keep in mind that a. it wasn’t necessarily personal, or b. maybe they were just knuckleheads and didn’t know any better (screamers, despite thinking they should be leading the Pro Tour , can be knuckleheads too), or c. I could chalk it up to oxygen debt. In any case, screaming back wasn’t going to help. I will line up again with these guys tomorrow, and the next 4 days after that. I figure it’s better to feel like talking to the guy next to me than to feel like shoving him off his bike. (*) Brick Tamland in Anchorman. For years I’ve driven by the Vrooman Road exit off I-90. I always thought it sounded as if there should be a drag strip off that exit. You know, Vroom-man Road. Actually there is sort of a drag strip off that exit. Thursdays at 6:30PM during the summer months, Jim Behrens hosts a low-key time trial starting at the Leroy Township fire station. Jim shows up at around 6:20, and if there are guys there, the race is on. Otherwise he drives home. Most people ride to the race. Some show up with full-on time trial bikes and aero gear (that would be me). There are some with clip-on aero bars or triathlon bikes. And there are some who show up and ride Eddy Merckx-style on their normal road bikes. Depending on who shows, Jim may decide on the start order. It’s training, and there’s no sense in ruining someone’s morale by getting passed. (But then again, sometimes the fear of getting passed is a good motivator). 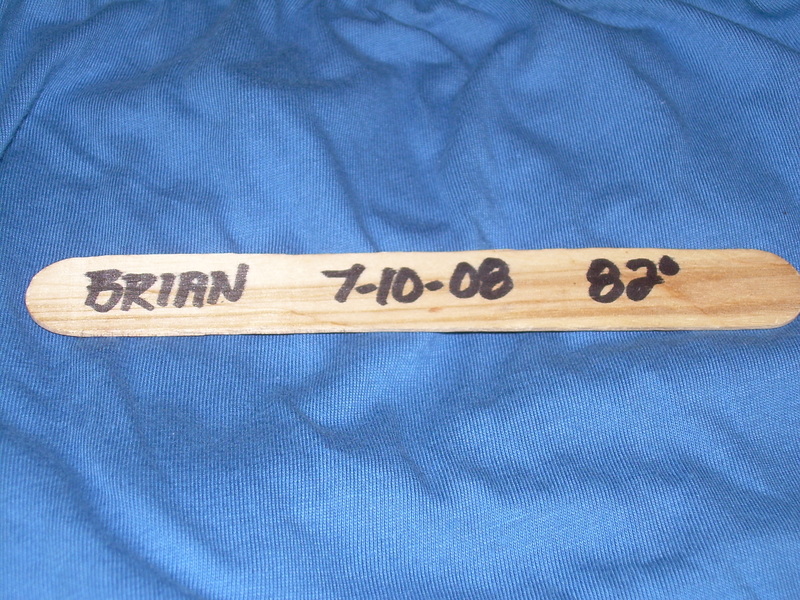 Or he may have you draw for a starting place by picking from the bunch of popsicle sticks he holds out. Jim holds your bike while you clip into the pedals, and then lets you go at 1 minute after the previous rider. After everyone has started, he walks to the other side of the road and waits to record the finishing times. The course is just under 4 miles out to a turnaround marked by an ‘x’ in the road, and then back again to the fire station. No marshals. You have to watch for cars behind you when you make the turn. There is no prize money. No medals. But no entry fee either. Just bragging rights. 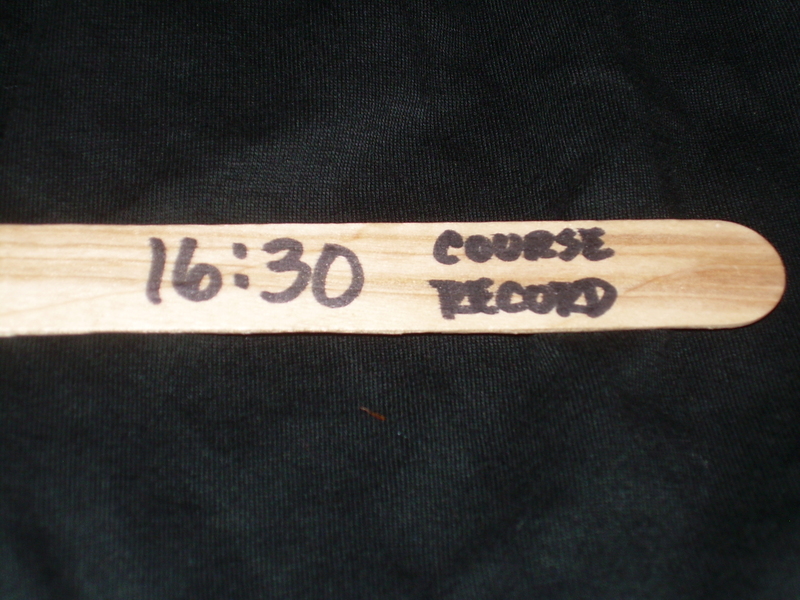 And your time recorded on the popsicle stick that you drew for your start time. Everyone who’s heard about the results-on-a-stick thinks it’s a pretty cool idea. I think it’s cool, period, that Jim puts this race on. These little grass-roots events, like our local Tuesday night training race, are what keep bike racing living and breathing. Without them, many of us would just be doing the club ride to the coffee shop. My wife was looking around the parking lot before the state time trial championship. “This is really interesting”, she said. She hadn’t been to a time trial before. The time trial is cycling’s version of an arms race: high zoot bike frames, carbon everything, disc wheels, pointy aero helmets. But she wasn’t talking about that. When you’re around it all the time, you don’t really notice. But looking around, even the biggest guys were in the skinny range when compared to the average super-sized American. A week later, I was sitting in a restaurant in Louisville during Nationals. When you are eating out alone, you have to find something to occupy yourself while anticipating the food that you will soon worf down. (This particular restaurant, Primo, was excellent, BTW). So I was alternating between watching people walking down Market Street, and eavesdropping. I saw a couple coming down the street. I knew, right away, this guy was in town for the ‘skinny guy convention’ (Nationals). He was dressed normally, but he had that bike racer look: lean. They came into the restaurant and took the table next to mine. I heard him talking on his cell phone to a teammate. I was the only other person in the restaurant who had a clue what he was talking about. The remainder of the week, it was pretty easy to spot the skinny guys. Guy sitting in the coffee shop with an omelet and espresso: bike racer. Guy at gas station buying microwave sausage muffin and $20 in lotto tickets: not a bike racer. I was perplexed by the ambiguous question mark in his subject. Was he asking us whether we knew of the term? Or was he asking us (or maybe subtly suggesting) if we were in fact Freds? Turns out he’d never heard the term. It seems they don’t have a term for such a person in the motorcycling world, but they do have posers. I said a Fred would be someone who showed up to a race with tennis shoes, a styrofoam Bell helmet, and a mirror attached to the helmet and/or handlebars.